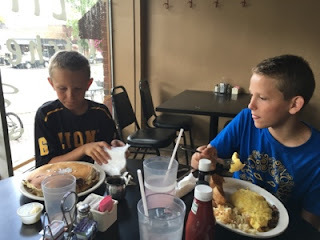 20160616 - Up in the am and L&D headed to Xenia OH for D's ballgames. JG&I got everything ready and headed to the field for G's games at Berliner Park. G's first game was a beating. We played an Elite team from Twinsburg that was REALLY Good. D lost his first game as well, but caught the whole game. Inbetween games JG&I ran to my work to drop off some parts for J's phone and G's ipod. We then stopped at Lilly's for a fantastic lunch. Back to the ballfield to for G to take another beating, not as bad this time... J helped with the music and it was a hard lose. D reported another loss as well :-( 4 Ls for the Winger boys today. After the games JG&I hit DQ for dinner and a treat. We then headed home for the evening. L&D stayed with Russ & Nancy close to the ball fields for the night.